A-CAIN EYE DROPS is a local anesthetic for ophthalmic instillation. Each mL of sterile, aqueous solution contains: Active: Proparacaine Hydrochloride 5 mg (0.5%). Preservative: Chlorbutal 5 mg (0.5%). Primary packing - 5ml Opaque Poly bottles White caps &Nozzles. Store in Refrigerator after the container is opened. Keep in cool & dark place. 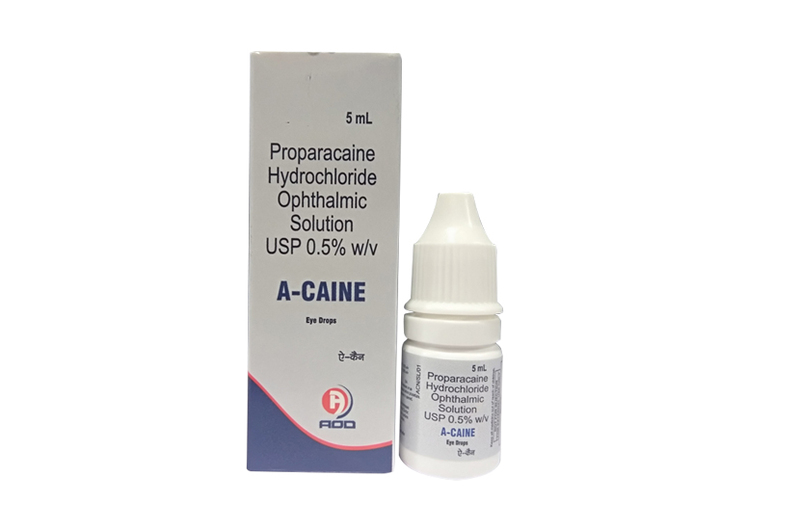 A-CAIN EYE DROPS is a rapid acting local anesthetic suitable for ophthalmic use. With a single drop, the onset of anesthesia begins within 30 seconds and persists for 15 minutes or longer. The main site of anesthetic action is the nerve cell membrane where proparacaine interferes with the large transient increase in the membrane permeability to sodium ions that is normally produced by a slight depolarization of the membrane. As the anesthetic action progressively develops in a nerve, the threshold for electrical stimulation gradually increases and the safety factor for conduction decreases; when this action is sufficiently well developed, block of conduction is produced. The exact mechanism whereby proparacaine and other local anesthetics influence the permeability of the cell membrane is unknown; however, several studies indicate that local anesthetics may limit sodium ion permeability by closing the pores through which the ions migrate in the lipid layer of the nerve cell membrane. This limitation prevents the fundamental change necessary for the generation of the action potential. A-CAIN EYE DROPS is indicated for procedures in which a topical ophthalmic anesthetic is indicated: corneal anesthesia of short duration, e.g. tonometry, gonioscopy, removal of corneal foreign bodies, and for short corneal and conjunctival procedures. A-CAIN EYE DROPS should be considered contraindicated in patients with known hypersensitivity to any of the ingredients of this preparation. NOT FOR INJECTION - FOR TOPICAL OPHTHALMIC USE ONLY. Prolonged use of a topical ocular anesthetic is not recommended. It may produce permanent corneal opacification with accompanying visual loss. Usual Dosage: Removal of foreign bodies and sutures, and for tonometry: 1 to 2 drops (in single instillations) in each eye before operating. Short corneal and conjunctival procedures: 1 drop in each eye every 5 to 10 minutes for 5 to 7 doses. A-CAIN EYE DROPS is supplied in one Opeque Polethylene Bottle packed with printed labeled in a unit carton and, Such 25 Carton Packed in a Shrink Sleeves.Such 12 shrinks packed in a shipper.